On our last trip to Calabria, Italy, I was obsessed with their clams. For the first week I ate clams every day, sometimes for lunch and sometimes for dinner. The simplicity, the freshness and quality of the ingredients were really apparent. 1. While cooking the linguine, sauté garlic in 2-4 tbsp olive oil. 2. When garlic begins to soften and brown slightly add 1 cup of white wine. 3. When the wine come to a simmer add the clams and cover. 4. After a few minutes, add the cherry tomatoes and some freshly chopped basil. 5. 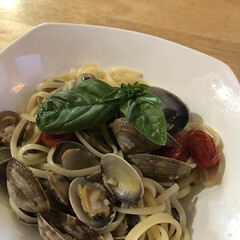 When the clams have all opened and the cherry tomatoes have cooked for a few minutes, add some fresh lemon juice, a ladle of pasta water and the al dente linguine. 6. Let cook for a few minutes before serving with a couple of fresh basil leaves on top.